Each person has their own favourite place to eat and opinions to go. There are numerous restaurants to cater for every taste including Chinese, Korean, Thai, French, European, Italian, Mexican, McDonalds, Pizza Hit and of course Moroccan. The following are restaurants visited over the past 12 months and experiences of these, which has been generally favourable although restaurants have also been mentioned which would be avoided, even if the management had changed. 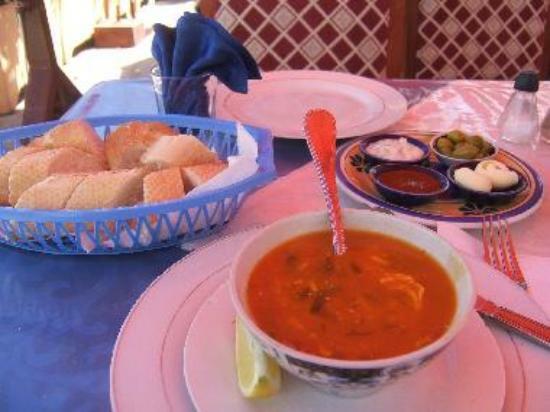 Favourite Moroccan food is soup known as harira (lentil, chickpea, cinnamon and coriander – with or without meat) and pastilla which comprises chicken, parsley, cinnamon, saffron and almonds wrapped in a parcel of filo pastry sprinkled with sugar and cinnamon. Pastilla can also be made with pigeon meat. Most restaurants will give olives and bread free as a starter and perhaps an accompanying salad, this will also apply to restaurants offering set menus from 45Dh which is very cheap indeed. Most tourist hotels will admit anyone entry to their restaurants although menu prices are generally quite high. 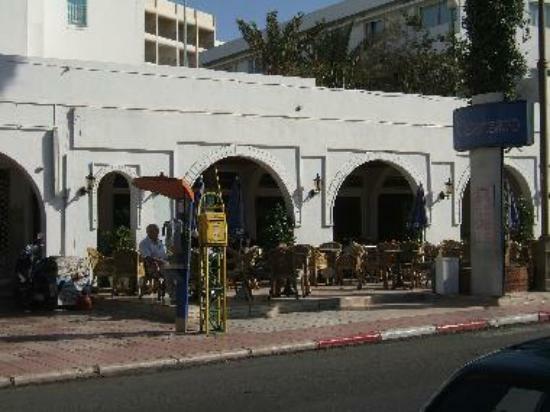 Hotels usually have Moroccan entertainment on at leat one night of the week which really does help to liven up the occasion and tourists are sometimes welcomed to participate. Please note that it is not recommended to haggle in a restaurant which has prices displayed either outside on a board or on the menu. If you ask for something not on the menu, you must ask what the cost will be. Many of the restaurants in the tourist sector will serve beer and alcohol with meals, even during Ramadan, to non-Muslims. Elysee Beach good for entertainment but only go once as the routine gets too familiar and the food isn’t great. Includes Moroccan entertainment. Moroccan/French/European. Prices are moderate. Le Ven Dome never seemed to have green olives on the two visits I made. Disappointing tajine. Moroccan/French/European. Prices are moderate. Camels has got a bit expensive lately, nothing special, waiters always ask for tips which is fair as they are poorly paid. Moroccan/French/European. Prices are moderate. Herguita La Maison Brochettes is good for lunch although there is no indoor seating and with passing traffic being quite heavy, ones appetite can easily be spoilt when dining in the evening. Moroccan/European. Prices are low to moderate. Jardino is very presentable and does a good lunchtime set menu at 45Dh for three courses. Moroccan/French/European. Prices are moderate. Catanzaro has always been good for lunch and evening meals. Moroccan/French/European. Prices are low to moderate. Le Jazz is a classy place with good service but not inexpensive. Has live entertainment and is one of the best in town. Gets very busy later in the evening. Moroccan/French/European. Prices are moderate to high. Le Jardin d’Eau is good for evening meals. French owned and has a modern ambience. Usually has entertainment with singers and is popular. Moroccan/French/European. Prices are moderate to high. 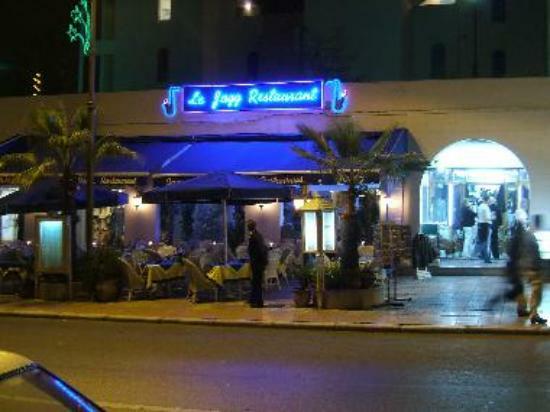 There are several other restauants on this part of the road including Fouquet. Cesars near the Agadir Beach Club hotel was ok but the chef left suddenly and now does not have such a good reputation. Moroccan/French/European. Prices are moderate. El Paradiso attached to (and part of) Hotel Argana – guests of the hotel get a discount. One of the best in town; has gone through several themes, European to Chinese and now European again. The head waiter is such a nice guy and knows his business very well. Moroccan/French/European. Prices are moderate. Queens is near the fountain at the junction of Hassan II and Passage ait Souss. Good for lunch and takeaway snacks. Moroccan mainly but a bit of European. Popular and very inexpensive. Several Italian-style restaurants here, just beyond Uniprix supermarket. Too much traffic polution here so the area is avoided. In the Talborjt district, where Agadirans live, are many inexpensive restaurants where a typical three course meal will cost 45Dh. Yacout is a small but somewhat grubby restaurant on Ave 28 Fevre, off Ave Hassan II. The washrooms should be avoided so sit well away near the outer walls. It has a quaint setting with caged birds and fowl roaming freely. The set menu at 65Dh will get you salad Marocain (with sardine & egg) or chicken pastilla as a starter, chicken tajine or seven veg tajine with cous cous for the main meal and patisserie Marocain (sweets) or speciality of the house for dessert. Bottles of soft drinks are the cheapest in town. Moroccan. Prices are low. 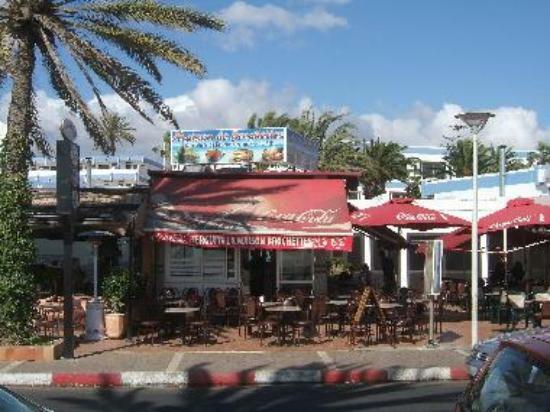 At the far end of Rue Allal Ben Abdellah are three popular restaurants Ibtissam, Mille Et Une Nuits and Etoile D’Agadir where the menu has tajines of chicken, lamb, camel, squid, fish or skewers of beef or lamb. 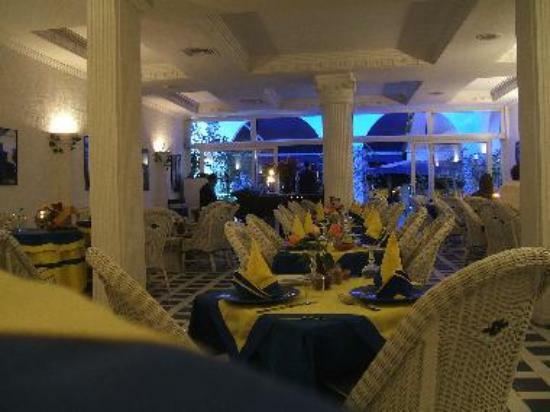 Ibtissam the preferred restaurant with better service and more generous dishes. Mille Et Une Nuits (1001 Nights) served tajine where it was difficult to find the chicken. Etoile D’Agadir (Star of Agadir) served piping hot tajine but the chicken appeared to have been put in as an after thought and was luke warm at best. Always complain if not hot throughout. 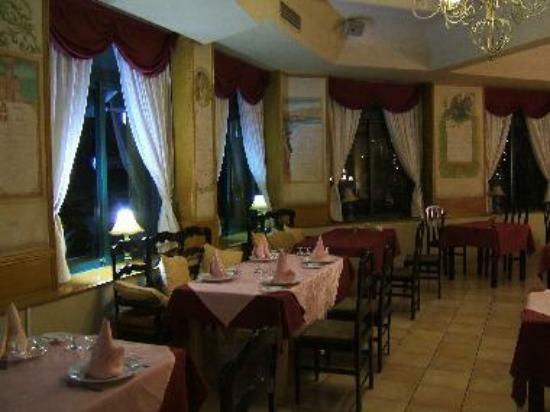 There are many restaurants in Talborjt on almost every corner or underneath hotels. The costs are almost always 45Dh for three courses. 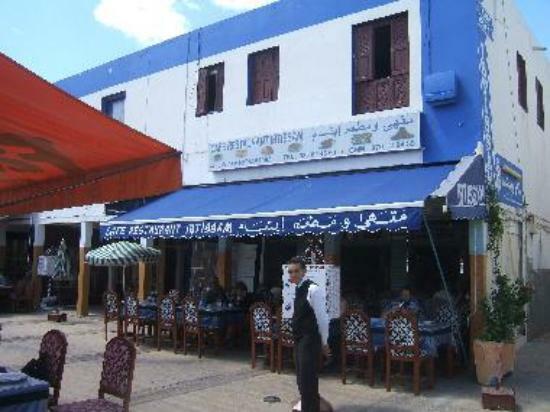 At the port of Agadir theree are many small seafood restaurants. Whilst prices are fixed and should be the same, some will try to fleece you particularly if you go with a guide which is totally uneccessary as he will arrange for you to be overcharged and where the bill may easily come to around 400 Dirhams for two which is five times what you should pay. Do not be afraid to complain as there is an official there to oversee that people are treated fairly. 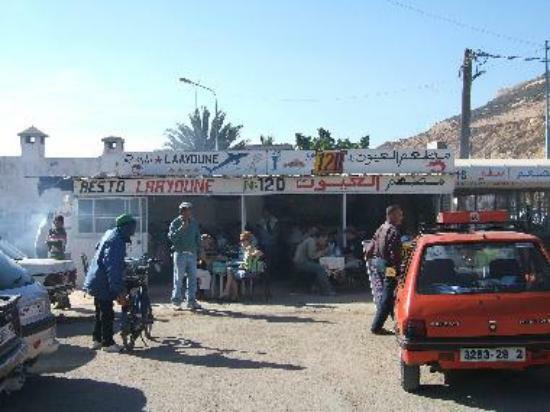 Laayoune is the first you will see on approaching the port and is the best there. 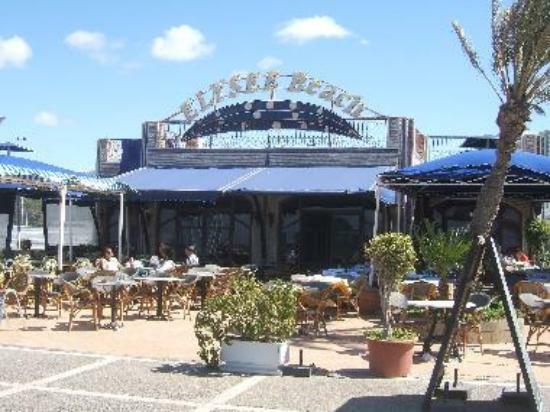 It is very popular and serves freshly prepared seafood and the salad has to date been safe to eat. Here you can have an assortment of fish, squid, prawns and more which can be grilled or fried for relatively little outlay, typically 45Dh for sardines, salad and bread. Be sure to ask in advance what the cost will be and don’t be afraid to haggle if the price is too high, expect to pay about 60Dh for other than sardines including a drink. In the large market, known locally as a souk, there is not much choice but there is a port-style eatery where you can get seafood and meat dishes for little cost and a few smaller restaurants in the vicinity. Savannah was one of the best in town and had a bar next to the restaurant downstairs but this has now been moved upstairs and is quite dark and pokey and caters for those Moroccans who wish to indulge in alcoholic beverages with anonimity. Has big screen upstairs for sports but few if any tourists go up there. Asiatic Kim Hoa had the most awful Chinese cuisine ever encountered; no Chinese staff hence no authenticity. Ice Valley is a modern restaurant on Ave Hassan II with an ice cream parlour frequented by younger Moroccans. Arrogant waiter laughing at the fact a non-smoking area was requested. Mimi La Brochette on Avenue Tawada is much hyped for brochettes (kebabs as the translation goes). You may see them advertised in journals, travel guides and in hotels but this is advertising at the forefront. Expensive and overrated. 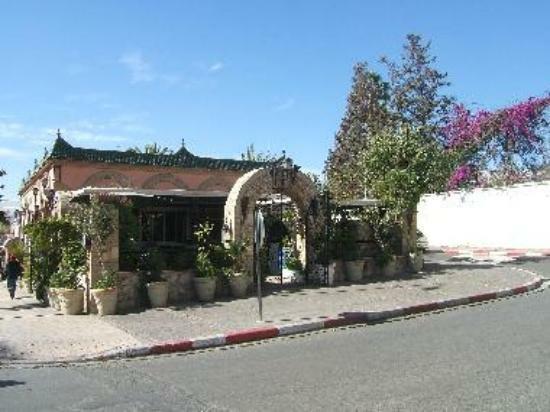 Bab Marrakech on Rue de Marrakech is the worst ever and must be denounced. A chicken tajine was requested for one person but what was presented was enough to feed a family of four. When a 200Dh note was presented for payment, change of less than 50Dh was given and no amount of argument could persuade them to give more and I left outraged. The place was being run by a boy who seemed to take pleasure in the fiasco. This is one place I urge you to avoid at all costs.